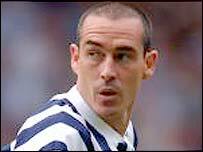 West Brom striker Bob Taylor has said he feels frozen out at the club by boss Gary Megson. Taylor has not figured in the Premiership since the end of September and Megson has recently said he will not bow to pressure from the fans and play the veteran striker in his testimonial season. The club's supporters have been clamouring for 36-year-old Taylor to be given an outing in the Premiership and started chanting his name during the loss to Chelsea on Sunday. Taylor, who played a key role in the Baggies promotion last season, said: "I train with the kids and have no contact with the manager. "I haven't spoken to him for four months. I'm trying to do well in the reserve games and I'll keep plugging away and try to score more goals. "The manager has been quoted as saying I'm still in his plans but I think I'm way down the pecking order. It's getting a bit too late to try and get in now with only eight games of the season left." Megson had earlier defended his decision not to select Taylor on a regular basis this season. "I understand that people are looking at the past, at what Bob Taylor has done in the past, and are saying 'Bob will do this and that for us' - but it's my view that he wouldn't," said Megson. "He's 36 and he's played nine reserve games this year. I see him day in and day out. I see the reserves. I know what is going on. "I understand that people have a soft spot for Bob and they must realise that it was me who brought him back to the club. "At that time one of the club fanzines was saying it was a mistake for me to do that. "Bob deserves a bumper gate for his testimonial match and has been a magnificent player for West Bromwich Albion. "He is not happy at not being involved and I understand the crowd turning round and saying what they are saying. "But Bob Taylor has not played a Premiership game and sentiment is just not part of picking the team."